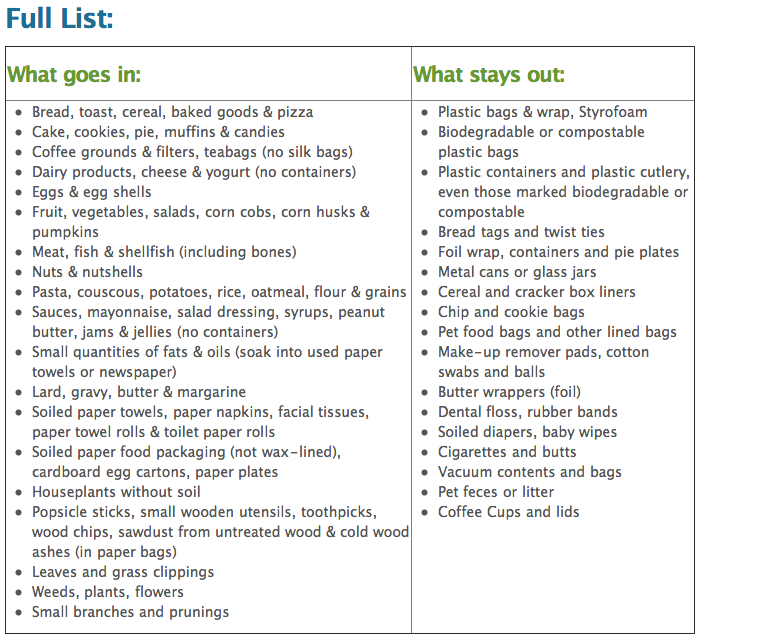 Up to 40 per cent of household waste can be composted, including dairy, bones, all food scraps including cooked food, yard trimmings in smaller amounts and even food-soiled paper. According to Metro Vancouver’s website, almost 1/3 of food purchased is wasted in our region. The region of Metro Vancouver recycles somewhat, with condos and apartments recycling 14 per cent of the time, and houses recycling 44 per cent of the time. The typical cost of garbage and recycling pick up in West Vancouver (for one single-family home) for one year is $267.28 ($194.44 for garbage and $72.84 for recycling). The cans and can’ts of the green bins! Photo from Metro Vancouver’s site. West Vancouver joined the Metro Vancouver pledge to lower waste and increase recycling and composting, vowing to reduce solid waste going to landfills (like food scraps) by 70 per cent. The GVRD set up a food scraps composting pilot program in 2010, testing with 500 houses in Caulfield. As of May 2012, the district of West Vancouver accepts all food scraps in green cans. An aquaponics seminar is being held this Saturday Nov. 10 to explain the benefits of a backyard aquaponic system for growing fish and vegetables and other foods in your own home.For those interested in food security like my mother, this sounds pretty neat (though intense). My family has always recycled and used our green bins (or green cans, as they are called in West Vancouver) but for those of you who don’t, here’s a basic crash course. Take your food scraps and put them in a container, usually on the counter. Be sure to use one with a lid. Get your child (or failing that, your partner or self) to take out the counter container once it’s full to the green bin outside/in your garage/etc. On garbage day, put out your green bin to be emptied. Congrats, you’ve helped the planet out! For more about recycling on the north shore, see the NSRP’s website. Compost coaches can be scheduled to come to your home and teach you how to compost that takes between 20-50 minutes.